Got pavement ants everywhere? We are your Perth Pavement Ant Control experts! As their name suggests, pavement ants usually make their homes under sidewalks and driveways, building slabs and large rocks. In early spring, colonies attempt to conquer new areas and often attack nearby enemy colonies. These result in huge sidewalk battles – very cool to watch if you are 5 or 6 years old! During the summer time the pavement ants dig out the sand in between the pavements to vent the nests and to make room to lay eggs. Pavement ants are dark brown in colour and measure 2.5 – 4 mm in length. Pavement ants will eat almost anything, including insects, seeds, honeydew, honey, bread, meats, nuts, ice cream and cheese. As noted in the picture above, the winged reproductives are several times larger than the worker ants. Swarming pavement ant reproductives are often mistaken for the more destructive carpenter ant. 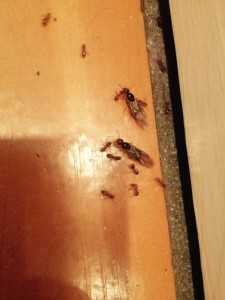 On the west coast, pavement ant swarms generally occur between the beginning of June and mid-July. Winged reproductive ants typically swarm in the spring but have been known to emerge any time of the year in heated structures. After emergence, the ants mate and the queens burrow into the soil to begin laying more eggs. After a few simple questions, free estimates can be given over the phone for insect control in All Perth Metro and Country Areas. Call the Perth Pest Control experts now at 0416334479 or contact Frank Gilmour Pest Control Perth by email. In addition to insect control and prevention, we also specialize in complete clean-ups of the affected area.